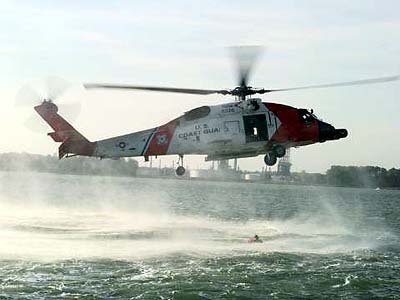 PORTSMOUTH, Va.- The Coast Guard has suspended the search for three overdue boaters on the James River this afternoon. The Coast Guard recovered the body of Lewis Mclean, 53, a Suffolk resident one mile south of the James River Bridge at 11 a.m. today, Kelton Troup, 14 and Desmond Mclean, 8, also from Suffolk have not been located. The search began at 11 p.m. Saturday after the Coast Guard was notified that the boaters were overdue. The Coast Guard Cutter Seahorse, a 41-foot search and rescue boat from Station Portsmouth, a HH-60 Jayhawk Helicopter from Air Station Elizabeth City, N.C., an Army dive team from Fort Eustis, and members from the Virginia Mairitime Resource Police and the Virginia Maritime Resource Comission were involved in the search.. The Coast Guard sends its thoughts and prayers out to the victims families during this difficult time.